Cryptic Darkness >> fashion sense. Though she is undesiring of attracting others with her cynical and often menacing exterior, Rogue's attractive character design and fashion sense express that of her interior. 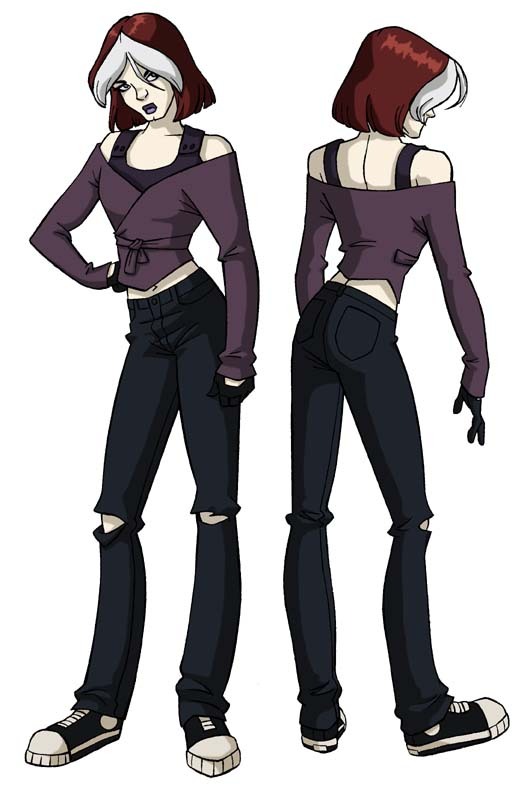 Though it may appear as though her method of attire is simply used to further convey her stereotypical "Gothic" role and provide a loud contrast to the neighboring characters of the series, the vocabulary of both her appearance and clothing truly serves a purpose of it's very own: expression. 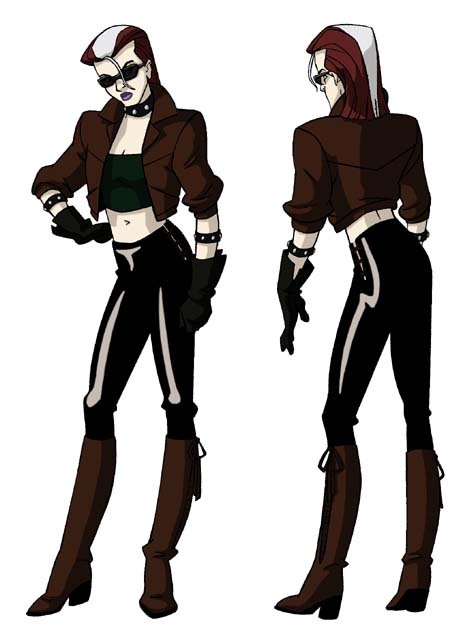 This is the outfit that Rogue wears throughout most of the series. The director of the series claims that they "were playing with the idea of showing a lot of skin, but needed to keep it covered, because of her power." The original style is found to compliment her; it is a combination of a black halter top, covered by a sheer blouse. From her waist down is composed of a pleater black skirt, gray leggings, and combat boots. A few other noticeable accessories include studded collars which are found upon her wrists and neck, including her obvious black lipstick and other facial make-up. A very important accessory of hers is very much her pair of gloves; as well as sustaining her abilities, gloves also convey power, mystery and protection. One concept that was rejected by the network was Rogue's navel ring. This is Rogue's official X-Men uniform; it consists of a navy blue figure, a green-plated pads cover to protect her bust, attached with an X-men utility belt sporting the "X" logo -- the same significance of the shoulder pads -- along with a thick pair of sand-coloured gloves. Rogue's X-men uniform also reflects the reclusive appearance; however, with her usual green. 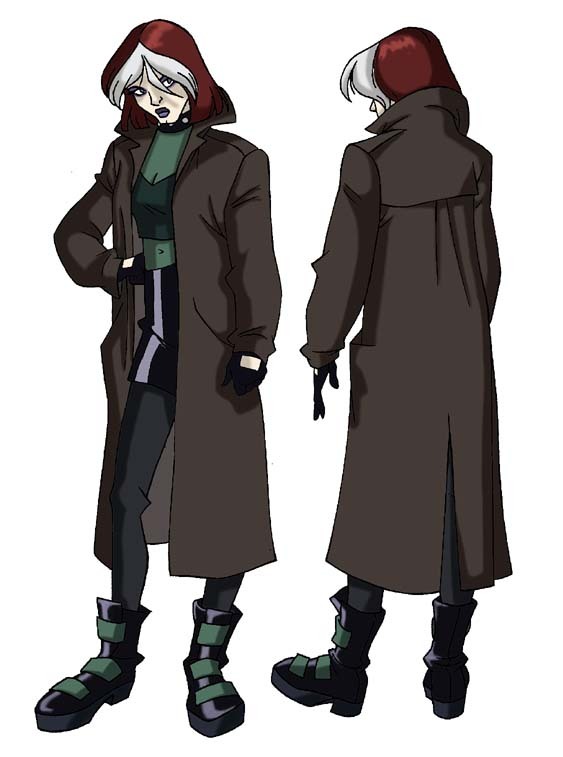 One of the initial attributes that the audience notices about Rogue is that her appearance is very often concealed within very dark colours; these colours include the obvious green, black and purple. Green conveys envy, trickery, renewal and evil; black implies emptiness, sorrow and despair; meanwhile, purple represents truth, justice and injury. This melancholic variety implies depression, loneliness and a private nature in which the Rogue carries throughout a majority of the series.